I don't really remember when was the first time I tried chicken piccata, but I think it was in Seattle. I fell in love with it instantly. But then again, it's pan-fried chicken breasts served with rich lemon caper sauce. What not to like? Using a mallet, pound the chicken breasts until slightly flatten. Season with salt and pepper, and dredge both sides of chicken in flour. Shake off the excess flour. Melt 2 tablespoons of butter and oil in a large skillet. Fry chicken breasts in hot oil, about 5 minutes each side, until cooked through and golden brown in color. Transfer chicken breasts to a plate. Return chicken breasts to the skillet. Cook for another 5 minutes until the sauce is slightly reduced. Transfer chicken to a large plate, pour the sauce over the chicken and sprinkle with chopped parsley. Serve with cooked pasta. This looks delicious. I love chicken piccata. I bookmarked it into my Chicken recipe folder. Just a note - the picture looks like your are using capers. Caperberries are about the size of a grape or olive and have a different taste also. They are not interchangeable in recipes. I love them both. Lovely blog. Count me in. oops! I meant "you're", not "your using". Sorry. 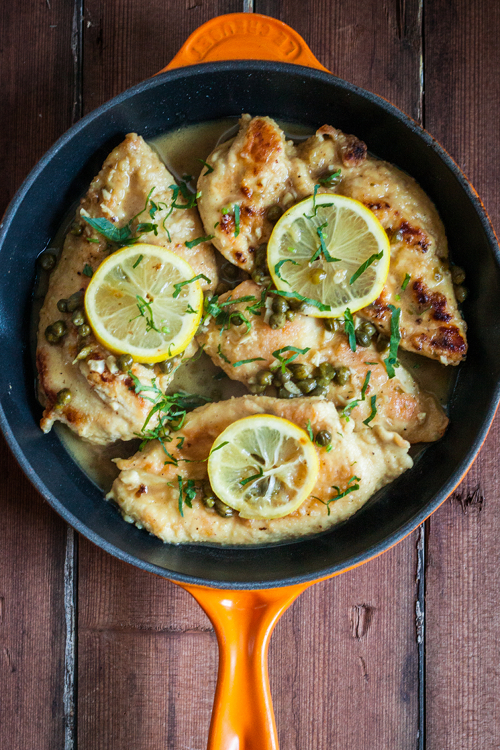 I love Chicken Piccata too... can't wait to test out your version! Have to agree with Jan. Well said. I made this for dinner tonight and it came out perfectly! Thanks for the recipe!! Is there any way to substitute something else for the white wine? 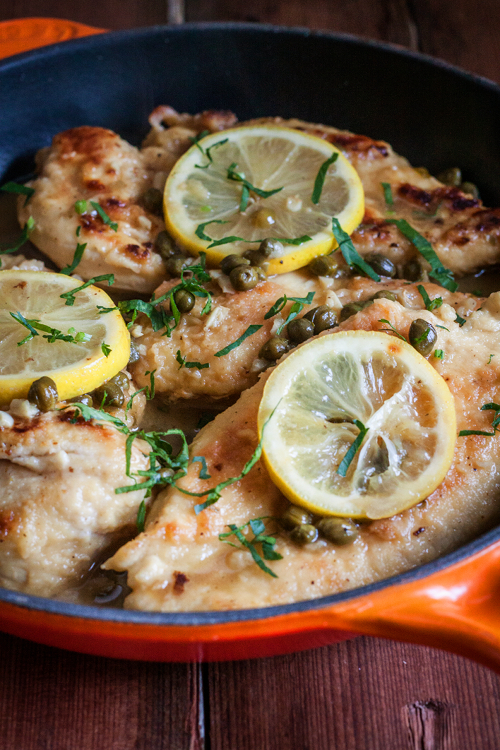 We dont eat foods with alcohol...but i have had Chicken Piccata and i love it (without wine)!! The heat 'cooks off' the alcohol! One easy substitution for dry white wine is white wine vinegar. Made from dry white wines, these vinegars have many of the same flavor characteristics as white wine, but without the alcohol. If you don't have white wine vinegar, use another light-colored vinegar such as apple cider vinegar or rice wine vinegar. Even white vinegar may work. Since rice vinegar is less potent than most vinegars, you can substitute one part of it for one part of dry white wine. If you are using apple cider vinegar, use half the amount your recipe calls for and replace the remaining liquid with water. If the OP is Muslim, alcohol is forbidden to drink or consume in foods. It doesn't matter if it's "burnt off." You can also use alcohol free cooking wines. To add a festive touch to the recipe, I add quartered artichoke hearts. Great recipe! I didn't have fresh lemon...only lime juice from concentrate, so it tasted really acidic. UNTIL I added about a teaspoon of brown sugar for balance. Hubby loved it! Fantastic! Thanks so much, I have made this recipe about 5 times and find it delectable. Oh, this was delicious! All the comments gave me the confidence to try this for company tonight, and it was a hit. This is one of my favorite meals that I like to order at a local restaurant. Would you mind sharing the exact brand of "dry white wine" you prefer to use in this recipe? How does one know how to choose a "dry white wine?" What makes it earn that title? Does this wine come in small bottles? Exactly what are capers? Are they in the olive family or grapes? Capers are buds from the nasturtium plant. This was a fabulous recipe....restaurant quality and maybe better! We would serve this to company-we used sauvignon blanc for wine....and capers are in the pickle aisle in our grocery store....they're a must for so many recipes! Priscilla, I made this for dinner last week and I still cannot get it our of my head or my taste buds - it was delicious! I took some pictures, credited your blog for the recipe and posted it here: http://www.aaronandyolanda.com/2015/01/chicken-piccata.html. Thanks so much for sharing! I am sure there will be several more of your recipes that will make it to my blog. Keep up the great work! My apology in my (severe) tardiness in replying your comment. Life doesn't always allow me to check and update my blog very often lately. Thank you so much for trying and posting about the recipe. I'm thrilled you liked it and your dish looks so delicious. Kudos! Just tried this recipe tonight and it was met with two thumbs up from the entire family! Easy recipe for a weeknight meal that can also be dressed up for company. Thanks for sharing! Made this for my wife - valentines day. Turned out great even though I was missing the capers and had to use red instead of white wine. I thought this recipe was ehhhhh. Not to great, but not to bad either. What pasta do you recommend? Any kind will do, but maybe not gnocchi :) My family loves it with linguine or with penne. Wht if there's no capers wht can l substitute? I'm not sure what can be a good substitute for capers, green olives maybe? I used gluten-free panko bread crumbs and no capers. My family loved it. Thank you! I was wondering what white wine you used as well? Thank you and it looks delicious and i want to try to make it. I made this tonight exactly as written. It was delicious! Thank you! I'll be making this again for sure! I found this recipe on Pinterest and made it last night. It was amazing! So delicious and easy! I can't wait to try more of your recipes. Side note...I didn't have any capers and I used very cheap white wine and it was still great. I also think getting the chicken breasts as thin as possible is key to not overcook! thanks so much. We had this for dinner tonight, loved it! Quick, Easy, straight-forward, great tasting! I didn't have capers on hand so I added a little vinegar and sea salt to the chicken broth. Next time I will make with capers. Thanks for a great recipe! I didn't have capers either, so used chopped green olives- just very cheap ones. ( I took out the pimentoes). It worked well. Not a perfect match for capers, but quite excellent. Great recipe, felt like a treat. I cook for myself so it's important to have tasty easy recipes. Very good! My doctor suggested a paleo diet for 30 days and I thought this would translate well. I didn't use the flour, butter, wine, pasta or capers (I didn't have any). I pounded the chicken, seasoned with sea salt and lemon pepper. I cooked as directed but in coconut oil. For the second part I added more coconut oil and olive oil, sauteed a small onion and added homemade chicken broth and lemon juice. I added the chicken and let it warm in the juices. I served with sauteed green and orange peppers and a green salad. Huny liked this and I'll fix it again with rice for him. I'll use green olives next time too. Do you use the same sauce you cooked with the chicken for your pasta or do you like a complimentary sauce? Sorry, I didn't have any capers. Still tasted AWESOME ! I followed the recipe to the letter and found a few changes I'll make next time. First, more lemon flavor. I'll add some zest to the juice. Second, more garlic flavor; probably four or five cloves instead of two. In frying the breasts, I think the two tablespoons of butter plus five of olive oil was much more than needed, but I used a large non-stick pan; I'll reduce the olive oil to three tbs. I also found the flour wasn't enough to thicken the sauce, so I used corn starch in a bit of water, and the resulting consistency was perfect. This is amazeballs. I didn't have capers, and didn't have time to run out for them, but everything else I did exactly as the recipe stated. Oh, except less butter and oil because I'm watching calories. But the sauce, oh my word it's so good. My picky 6 year old even loved it. She said it was delicious, her new favorite. Can't wait to try it again, WITH capers! Thank you for sharing this recipe! How long should I let the garlic, capers wine and lemon heat up before I put the chicken back on? Made this lkast night. It was delicious and we all loved it. However, my sauce never thickened up. I will do as another suggested and reduce amount of olive oil and add a combination of water and corn starch. is this a gluten free recipe? I made last night! Wowzers, Am non drinker so I didn't have any dry white wine so I subbed white rice cooking vinegar and it was sooo delicious! Thanks so much for the awesome chicken recipe! This will like be on the menu at our house couple times a month now. Kids and wife LOVED it! I have made this recipe several times now - sometimes exact and sometimes with substitutions- depending on what I had handy. It's been delicious every time. Thanks for sharing it! Made this tonight. Came out really good. I love the fact that the chicken breasts are dusted with flour first. It adds texture. The only thing is, I added too much lemon juice, so to correct it I had to add chopped celery and carrots, double the wine and stock, and add a pinch of baking soda to the sauce. Next time I'll be more careful. I love the subtle flavor of the celery though. So I might add celery next time. And mushroom for some earthiness. Do you think this dish could be a made ahead and just reheat for a party? I am making a valentine dinner party and I want to make my dishes ahead so I can enjoy the night. Could you replace the pasta with couscous? Definitely! I used bow tie pasta but you could use anything really. Anything that works well with tasty sauce! I made this for dinner tonight, I made it just as the recipe states. It was flavorful and delicious. Thank you for posting. What temperature do I cook this at? I'm not a very experienced cook. I made this adding a little cornstarch to thicken up the sauce and it was amazing! The sauce was especially good on the roasted asparagus we had on the side. Thanks! Thank you for posting this recipe!! I made this for my husband and myself for supper last night and we both LOVED it!! Looks delicious!! On our menu tonight!! Fantastic recipe thank you! I made this last night for date night. Was simple and your instructions were perfect. Tasted restaurant quality! We both loved it and I will definitely cook it again! We had this tonight, it was great. I was a little wary after having too many chicken piccata recipes that were too lemony so I used only 3T of lemon juice but I think adding the 4th would be fine, it was great! Made the recipe and it tasted amazing! I'm so happy to get the great result with this recipe. Thanks a lot. I just made this and it was so easy and delicious!!! the chicken is really good reheated in the oven. The pasta, not so much. This is my husbands favourite dish now.....thanks for the delicious recipe! Fantastic post you have shared. here. I read your sites details and I understood that, Once in a while it stuns me how a straightforward mix of essential, close by fixings can yield such delightful results. Chicken piccata is just chicken bosom cutlets, dug in flour, caramelized, and presented with a sauce of spread, lemon juice, tricks, and either stock or white wine. It can be set up in 20 minutes or less and is so natural and flavorful it ought to be a piece of each house cook's collection. It's ideal for a speedy midweek feast! Quick and delicious recipe added to my cooking skill. Thank you very much. I have tried, It's very good for me. Thank you! I will try it tomorrow wish me luck! Saved as a favorite, I lopve your web site! This was AMAZING - husband made it to perfection. Served with mixture of canned tomatoes, chicken peas and zucchini. Superb combo! thx! !